We have a new book club at one of my middle schools, and the students decided that everyone should read a dystopia for our upcoming November meeting. I had just purchased Everland by Wendy Spinale, and then saw it featured at our Scholastic Fair, so I figured it would be a good choice. The premise is that London has all but been destroyed by the German ruler’s son, Captain Hook, who bombed (among other things) a medical facility that housed a deadly virus. Now, nearly all adult and female children are dead, and the Lost Boys are eeking out survival in the presumed-destroyed London Underground. Meanwhile, Gwen is a teenager trying to take care of her little sister, Joanna, and her brother Mikey. On a late-night scavenge she meets Pete and Bella, and the three soon become entwined in a mission to save kidnapped Joanna and to discover if Gwen is truly The Immune with the potential to save humankind. Great premise; however, the execution falls just a bit flat. Other characters from Peter Pan are woven in, sometimes not as successfully, and Hook waivers too widely between a sympathetic character and a monster. Still, students who enjoy Peter Pan and devour retellings will be pleased. I picked up Rabbit in Red a couple of months ago at a local author event at Barnes & Noble (Joe Chianakas is from Peoria). JChianakas’ novel is an homage to “classic” horror films of the 70s, 80s, and 90s, and has been described as a sort of Ready Player One for horror fans. Teenager Bill Wise; his Skype-friend, Jaime; and other horror-obsessed teens participate in an online contest to earn the right to further compete in-person for an internship with master of horror and director Jay Bell. Upon winning, Bill, Jaime, and 17 others spend a weekend of virtual reality gaming, reliving not only the horror films they love but also terrorizing moments from their own pasts. Chianakas cleverly weaves real world disappearances into this story, and the weekend becomes more than just fun and games for Bill and his fellow competitors. Most likely it is adults that will enjoy this fast-paced thriller, but teens who are really into those “old” horror movies will appreciate it as well. This books counts for my Horror Reading Challenge 2016. This weekend, MID-State Reading Council, our local division of the Illinois Reading Council, had a Book Fair at Barnes & Noble. During my shift, I held an impromptu story hour in the children’s area and read Click, Clack, Boo!, The Book With No Pictures, and Penguin Problems. The kids loved the Halloween theme and repetition of Click, Clack, Boo! and, of course, the silliness of The Book With No Pictures. I think Penguin Problems would work better shared one-on-one with a child, although it did keep the little ones’ attention. Those of you who are frequent visitors know that I don’t read a lot of adult books, but when I do, horror novels are my genre of choice. And I am always delighted to read and share scary YA books and creepy MG stuff. To quench my taste for all things horrific, I am in my second year of participating in the awesome 2016 Horror Reading Challenge, and I recently met my goal of reading 16 horror books this year (and it’s not even October yet). So when Tracy of Cornerfolds and Lilyn of Sci-Fi and Scary, the co-hosts of the reading challenge were in the market for a mini-challenge, I suggested a horror movie challenge, which we tweaked to focus on horror films adapted from books rather than just screenplays. I plan to post my progress here on this blog (since it’s my only one), and I hereby invite and encourage you to make a late entry into the Reading Challenge and a just-in-time entry to the 16 (bookish) Horror Films in October ’16 mini-challenge. Wait, I mean I DARE YOU! It’s the most wonderful time of the year – Halloween! (Okay, honestly I love Christmas most but Halloween is a close second.) This is my second year hosting the Horror Reading Challenge, this year with Lilyn from Sci-Fi and Scary as my co-host! With the help of Michelle @ I Push Books, who came up with this brilliant idea, we are bringing you a brand new Halloween mini-challenge for the month of October! The goal of this challenge is to watch 16 horror films in the month of October, but there’s a catch! 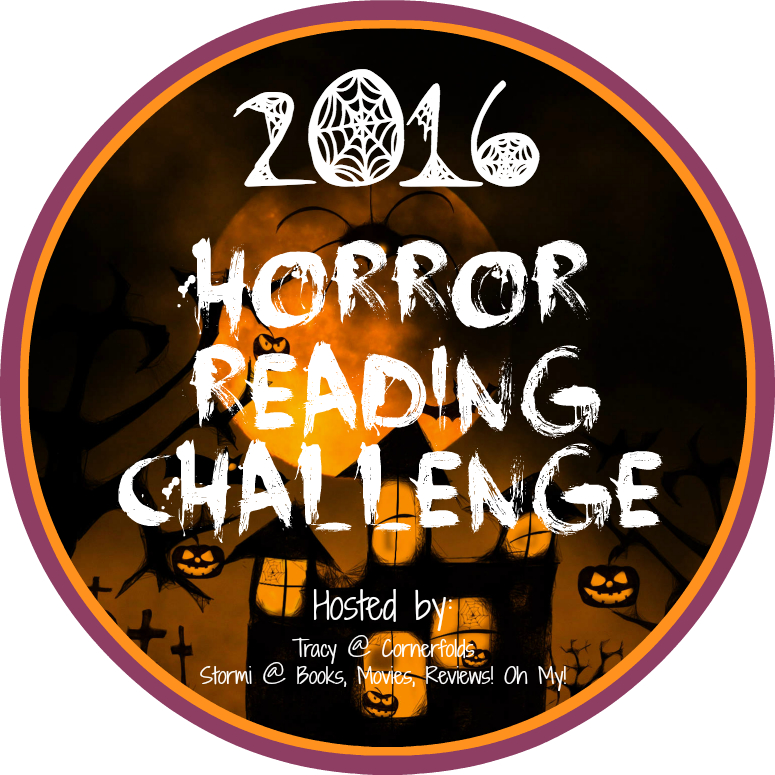 Each of the horror movies you watch for this challenge must be based on a book. Yes, there will be prizes at the end, but our main objective is to have a lot of fun and great discussion! We will be talking about all the movies we watch in our Goodreads discussion group!